We offer on-site service in Cumberland and York County Maine. Since 1995, Kenneth Barbalace, founder of J.K. Barbalace, inc., has been a website developer of award winning websites using industry standard best design practices and recommendations. Websites we develop are keyword optimized for good search engine placement, load quickly even across slow Internet connections, and look and function correctly across the broadest range of web browsers possible including Android based smart phones and Tablets as well as iPhones and iPads. If you are looking a for website developer who truly understand the art of quality website development, give us a call. We would be more than happy to meet with you and give you a free consultation and free estimate. J.K. Barbalace, inc provides database application development services for the Microsoft SQL, Microsoft Access, and LAMP (Linux, Apache, MySQL & PHP) environments. Our flexibility and experience allows us to create a database solution to suit our customers needs. We also offer on site database development services in Southern Maine (greater Portland area). Because we take a standards based approach to website and web based database application development, we can easily tailor/optimize projects for mobile devices like Android based smart phones and tablets, iPhones, iPads, etc. 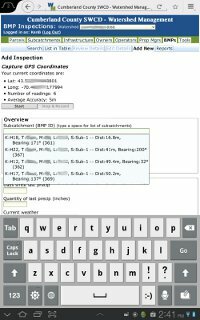 Tablets can be an ideal platform for the collection of field data because they are large enough to make effective data entry platforms yet still very light weight. Using a web based database application on a tablet can effectively eliminate the need to write field notes on printed forms, which then have to be entered into a database/spreadsheet back in the office. This can save considerable time and money, and increase productivity. Directly entering data into a web based database application can also help avoid data entries errors caused by entering hand written notes into a computer back in the office. Web standards based database applications optimized for mobile devices also have an advantage over typical mobile apps (e.g. Android and iPhone apps) in that web standards based database apps can be completely device independent as they run within standard web browsers (e.g. Safari, Android Browser, Opera Mobile, Dolphin HD, Firefox Mobile, etc.). This means that standards based web apps aren't locked to a specific mobile operating system and instead can be used on any mobile device. Sometimes firms will outsource all or part of their development work to third party sub-contractors in who knows where. We DO NOT out source our development work. It is all done in house here in Maine by us. This gives us absolute control over what goes into the programing code we provide.